Here's another Japanese fantasy about a couple of typically repressed/oppressed citizenry racing away to a free and exciting life. 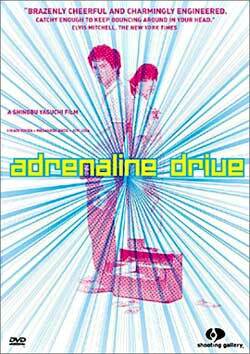 A young man, Suzuki (Ishida Hakari), picked on and bullied by his passive-aggressive boss, moves into a totally new sphere after his car hits the auto of a Yakuza and he's forced to go to mobster headquarters and apologize. While he's there, the Yakuza den suddenly explodes, blowing up all but one mobster, and Suzuki, a miraculous survivor, bolts with 320,000 yen of gangland green. His partner in crime is a studious, bespectacled nurse, Shizuko (Ando Masanobu), and they run away to a fancy hotel, rent the best suite, and, for the first time in their dull, chained-in lives, spend money extravagently: on clothes, haircuts... and contact lenses! Meanwhile, the leftovers from the mob chase after, and the surviving Yakuza from the explosion, the mean and sadistic Kurowa, escapes from the hospital and also comes for the missing money. It's all inconsequential and too familiar. Shinobu Yaguchi's film is intermittently entertaining, but Hitchcock he's not.